The film adaptation of West Side Story. West Side Story with book by Arthur Laurents, music by Leonard Bernstein and lyrics by a then-aspiring young lyricist (although he wanted to write both music and lyrics) Stephen Sondheim is one of the truly great musicals of all time. In taking Shakespeare’s Romeo and Juliet and transposing its story to the gang culture and conflicts of 1950’s New York, its composers created a musical which is as timeless as its source material. Originally directed and choreographed by the legendary Jerome Robbins, West Side Story opened on Broadway in 1957 where it ran for 732 performances. Surprisingly, when you look back the show only won two Tony Awards in 1958 for Choreography and Scenic Design. The big winner that year was The Music Man! There is little doubt that the popularity of West Side Story grew as a result of the movie adaptation made in 1961 which was co-directed by Robert Wise (director of The Sound Of Music) and Jerome Robbins. 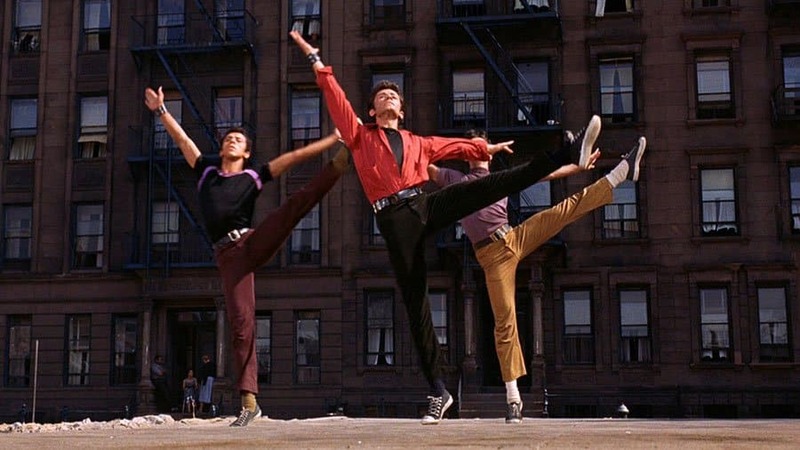 West Side Story was the second highest grossing film of the year in the USA and was nominated for eleven Academy Awards, winning 10 including Best Picture. It remains the record-holder for most Oscar wins by a movie musical. Created at a time when Broadway still was a key influence of the popular music charts, West Side Story’s impressive score included songs like Maria, Tonight, America, I Feel Pretty, and Something’s Coming all of which would be recorded by performers all over the world. Before his death Arthur Laurents revisited West Side Story, directing a Broadway production which wove Spanish dialogue and lyrics into the show’s libretto. The translations were provided by Lin-Manuel Miranda. Not bad for a show which was originally to be called East Side Story whose central plot was still Romeo and Juliet but whose central characters were from Irish and Jewish families!